Sometimes you go to a show and get more than a show. Sometimes you leave a venue excited about the future. Sometimes, experiencing a few hours of shared peace and euphoria leaves behind a feeling that everything that ails us is as easy to fix as trapping us in the right room with the right music. The glow can last for days. The great live albums — see: At Fillmore East, Babylon by Bus, Cornell 5/8/77, Live at Yankee Stadium Vol. 1 and 2, etc. — capture more than just perfect nights on memorable tours. They’re snapshots of artists in full flower. They’re documents of the power of music as a communal experience, of artists as mediums, of bands as translators for the sounds and feelings that live inside their minds, and of listeners as vessels for the might and magic emanating from the stage. When I listen to my favorite live albums, I catch myself imagining the room. The Watts, Los Angeles, church where Aretha recorded her 1972 double live album Amazing Grace takes shape for me when I hear it. It turns out I’m projecting. The real New Temple Missionary Baptist Church is a little different than I imagined. Really, I’m remembering the Baptist church I sang in as a child when I listen to Ms. Franklin’s blistering hymns on record. Church ways stick with you whether you stick with the church or not. That’s sort of the story of Aretha and Amazing Grace, isn’t it? Everything Aretha sang carried a note of gospel in it; no matter what she did sing, her gospel recording lingered in the rear view as her best-selling album. I now wonder why Aretha distanced herself from Amazing Grace, having finally seen the Sydney Pollack documentary that’s reaching the public only now that both performer and director have passed away, ending decades of legal disputes over its release. What was the catalyst? Was it Pollack’s fatal error in shooting the thing without syncing the audio properly? Did Aretha not want people to see her toiling away at the task, drenched in sweat, asking for water between songs like she’d gotten so caught up in the spirit that she forgot her surroundings? Maybe the ‘70s rock-doc explosion made her nervous. Labels were shamelessly, anxiously trying to bottle Monterey Pop’s lightning in those years, but not everyone who wanted to be a rock-and-roll star wanted to be a movie star too. (Amazing Grace isn’t the only troubled A/V project of the era. Warner’s plan to shoot the Grateful Dead on a 1970 tour cracked when the band gave the crew acid.) Whatever the case, the sights of Amazing Grace are just as valuable as the sounds. Amazing Grace the film humanizes a historic performance in vibrant color. You get to see the singer rapt in emotion, belting out breathtaking vocal runs like lightning searing through the night sky. You also catch the legend in repose, cheerily checking in with family as her father, Reverend C. L. Franklin, enters the room on the second night. You watch the audience receive the music heartily, clapping and whooping and cheering and crying. You spot Mick Jagger and Charlie Watts from the Rolling Stones bopping in the back of the congregation. You see chipper church formalities like the Southern California Community Choir’s opening two-step march in glittering silver garments. Animated Inglewood choir director Alexander Hamilton is a treat, as is the Reverend Dr. James Cleveland, founder of the SCCC and a powerful force in gospel music in his own right. Cleveland is the archetypal Baptist preacher triple threat. He speaks, performs, and hosts, keeping the room in high spirits and good humor. He’s thrilled to have a superstar share his pulpit and excited to work his way into the mix. Some of this levity was lost in the original retail version of the New Temple performance; for years, the 1999 deluxe remaster was our most accurate snapshot of the event. Visualizing the scene at New Temple adds to the sense that something special and timeless happened on those January nights. Watching the congregation and the choir go to pieces during Franklin’s devastating ten-minute “Amazing Grace” is a revelation. Gospel is a participatory art form. It’s a call and response. It’s about communing with your peers and your maker. Excellence in the form is a selfless act of sharing and worship. This differs greatly from pop and soul music, where the singer is usually the focal point of the audience’s appreciation. 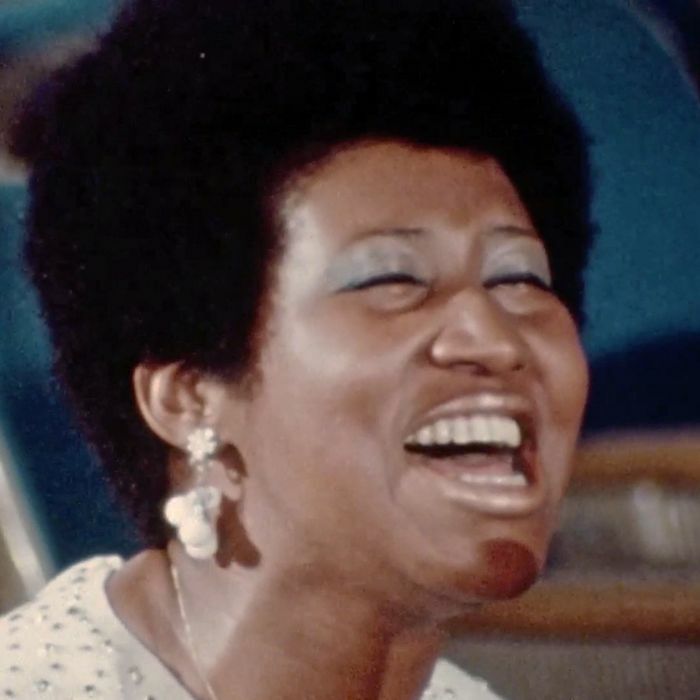 Aretha’s posture during Amazing Grace — stately, demure, joyful, eyes smiling — is not the same as her commanding presence during her Fillmore West gig from the spring of 1971. At Fillmore, Aretha wanted you to know that you were in the presence of greatness. At New Temple, you were in the presence of the Lord. Amazing Grace catches the beauty of the black church in full bloom as one of its finest exports comes back home to hold court. It’s full of love and joy and unity and masterful music, and if you can make it out to a theater where it’s playing, after all these years, go.